well I understand that the header doodle actually makes no sense 🙂 I initially made it as a sequel of a doodle ..
hahaha 😀 .. to kya awesome 😀 ? 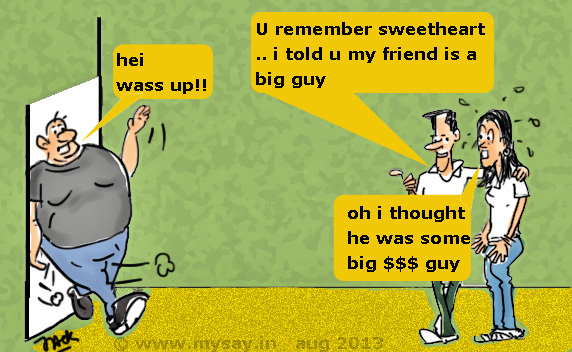 hahaha.. big guy hum bolte hain paise walo ko normally .. say casually we say oh he is one big guy – means he is filthy rich and powerful kinds ..
here the girlfriend thinks boys friend is some rich guy .. while he comes out to be a heavy guy literally !! Hahahaha thats how we talk at home!!! Good humor- Enjoyable post! Hahaha Yes we talk like that at home! Can related to it. Interesting and well put on doodle!